On October 24, the movie Ouija (Universal) will open in theaters across America, just in time for Halloween. It will be, in part, a horror movie and in part, a flick that hearkens back to a time when movie studios made films based on games, like Clue and, more recently, Battleship. Ouija promises to be a scary movie, but who stars in it, what is it about and what is the history behind the board game and film? Read about the game and movie, Ouija, then check out the cool trailer for it, below! Ouija has a young cast, many of whom are relatively unknown, with the exceptions of Bianca Santos, Douglas Smith and Olivia Cooke. While many of the thrills and chills in the flick are psychological ones, there are some that are spooky and creepy and might have people jumping in their seats as they watch the film in between the fingers of their hands, held up to their faces. The director of this supernatural thriller is Stiles White. The Ouija board the teen cast in the movie use is, apparently, possessed, perhaps by the ghost of a young girl. She was recording herself as she played with the heart-shaped wooden planchette and board used that reportedly spells out messages to questions, and she is mysteriously killed. The teens who wonder about the history and legend of the Ouija board in question find themselves messing around with dark forces beyond their ability to control. The movie reportedly had a low budget of just around $5 million. However, the flick has some big names behind it, like Platinum Dunes partners, Andrew Form, Michael Bay, and Brad Fuller. Fuller is one of the forces behind such hit movies as Friday the 13th, The Texas Chainsaw Massacre, and The Purge. Audiences who attend the movie Ouija or are thinking about going to see it might wonder how much of it is based on anything real. What is the history behind the Ouija board game and movie, if any? There is not any direct history to indicate that the events depicted in Ouija are factual. However, it, and all movies in which Ouija boards are central to the plot, have a history that has caused many people to conclude is diabolical in nature. Many parents will not allow such a board or planchette into their houses, considering them to be conduits to release evil into the world. To these people, Ouija boards games are not games at all, but are a direct invitation to permit the devil and his minions into the lives of whoever uses the board and planchette. The board game, itself, is only about 120 years old, having its origins back in 1890. The belief in “spirit writing” and using devices to help communicate with the dead, though, is much older, dating back hundred of years, if not longer. The concept of automatic writing, or spirit writing, in which the spirits of the dead communicate with the living through subconscious writing of replies to questions, goes back 900 years to China. 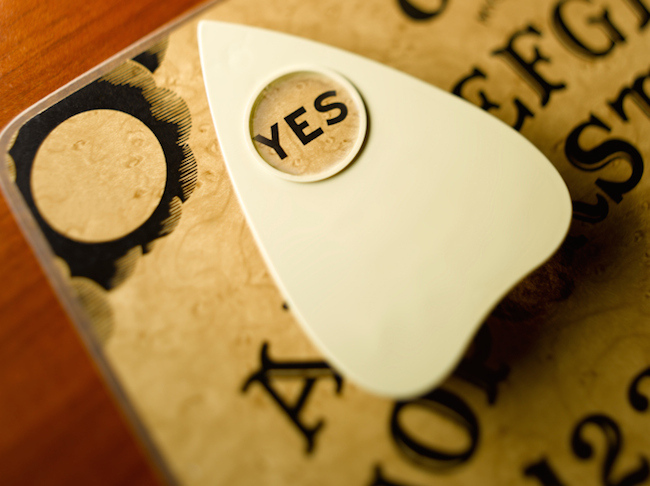 Supposedly, by placing the fingertips of whoever is using the planchette upon it, the wooden or plastic device will move seemingly of its own accord around the board, spelling out answers to questions and sometimes going to words like “Yes” “No,” or “Maybe” or even numbers on the board and answering questions using those types of answers. Parker Brothers began manufacturing Ouija boards in 1966 and Hasbro bought them out and took over making them in 1991. That company still continues to make the still-popular boards. There are people who are skeptical about where the “answers,” come from when users ask questions. The skeptics say that people using the planchette are the ones who cause it to move about the board, either on purpose or at a subconscious level directing its movements. Other people, ones who have personally used the boards and planchettes, have claimed that they do not move the planchettes and that sometimes the planchette will move even if there are no fingers touching it at all. To these people, the messages that the planchette and board delivers come either from spirits or demons or possibly the devil, though they often pretend to be spirits until later on. The idea for a movie based off of the Ouija board has been around at least since 2008. A movie was in production until 2011, when it was scrapped because it was getting too expensive to continue making it. One of the first horror movies that featured a Ouija board game was The Exorcist. Regan, the girl in the film who becomes possessed, uses a Ouija board alone, which supposedly served as an invitation for her body and soul to become possessed. That movie, based on the fictional novel of the same name by William Peter Blatty, is reportedly based on a true story of someone being possessed, though the person was a teenage boy, rather than a teenage girl. That is some of the history behind the Ouija board game and how the public’s fascination with the idea of communicating with the spirits of the dead lead to the development of the first Ouija board game in 1890. Despite being derided by skeptics and condemned by many people as being evil and diabolic, the sales of these board games continue to the present day. The concept behind speaking with the dead and the chance that pure evil could be unwittingly unleashed through something that looks like a child’s game just might draw record audiences to see the movie, Ouija, next weekend. 2 Responses to "Ouija: The Movie and the History of the Board Game"
That’s cool, I think I will like the movie very much!!!! Sounds like a spoooooky film that is right up my alley! Thanks for the great review! !